SKU: n/a. Categories: Bait Boards, With drawers. 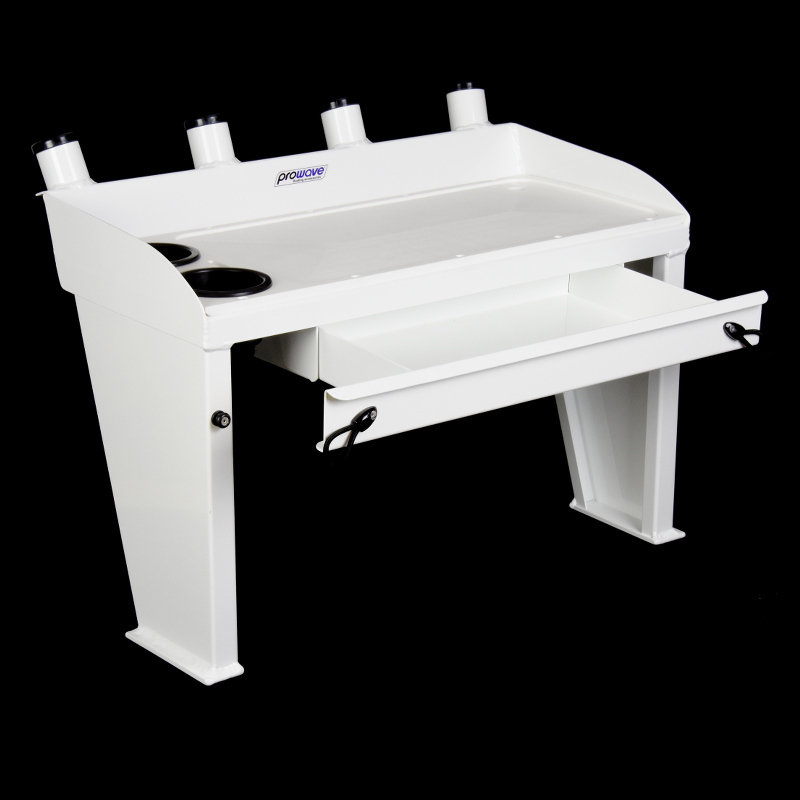 This is our Prowave ® Aluminium Bait Board with drawer and is fitted with 4 heavy duty Rod Holders 2 cup holders and 2 tool holder slots. 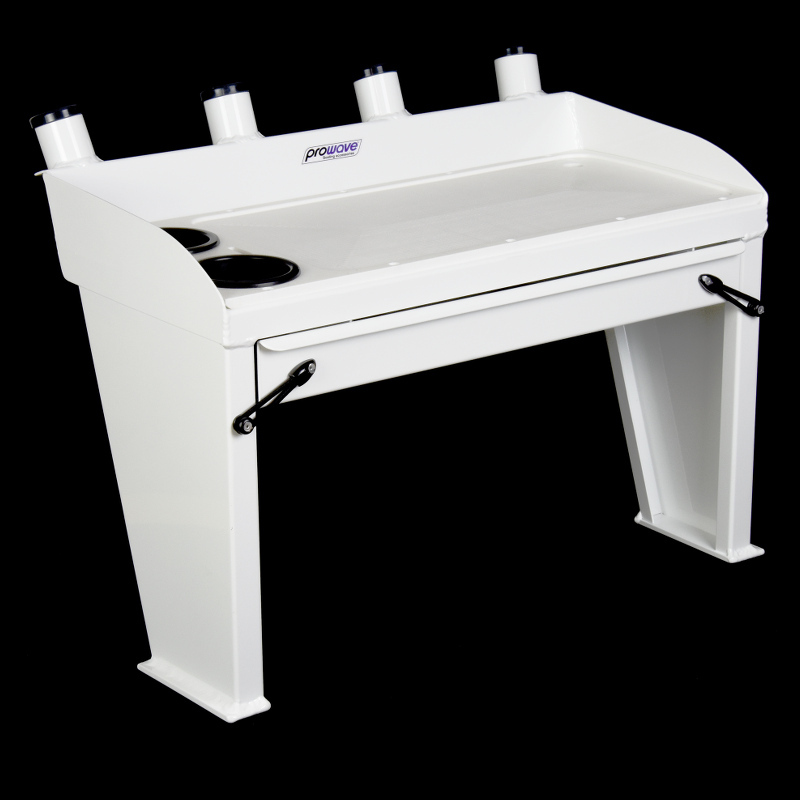 The bait board with drawer has been designed specifically for bolting to any trailer boat, fibreglass or aluminium. Our bait boards with drawer are constructed of marine grade aluminium which is ideal for years of marine use. 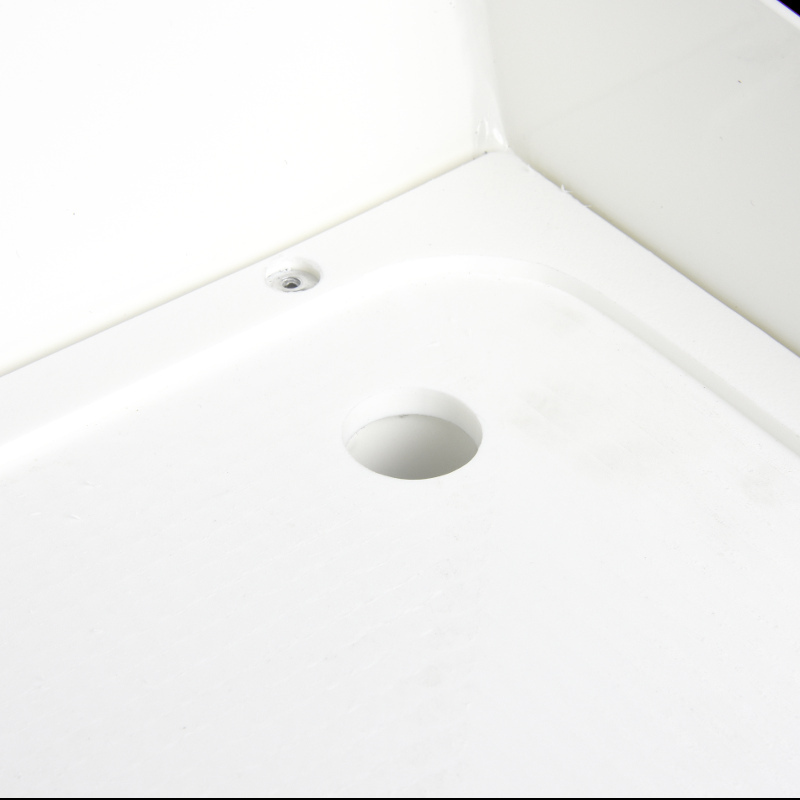 You can drill your own mounting holes in the feet to suit you boat. 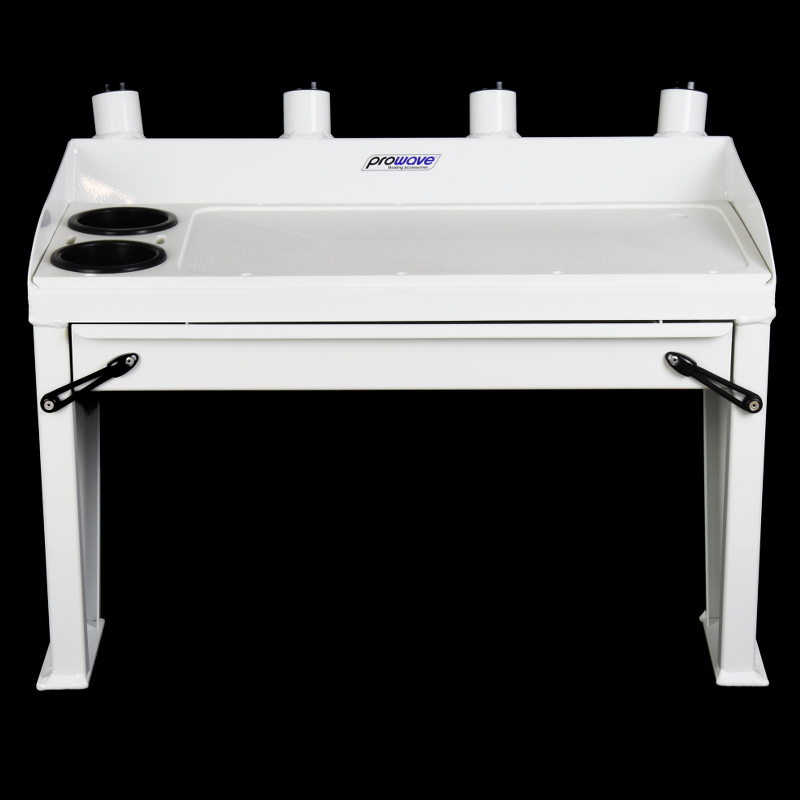 This Aluminium Bait board with drawer is painted in white powder coat. 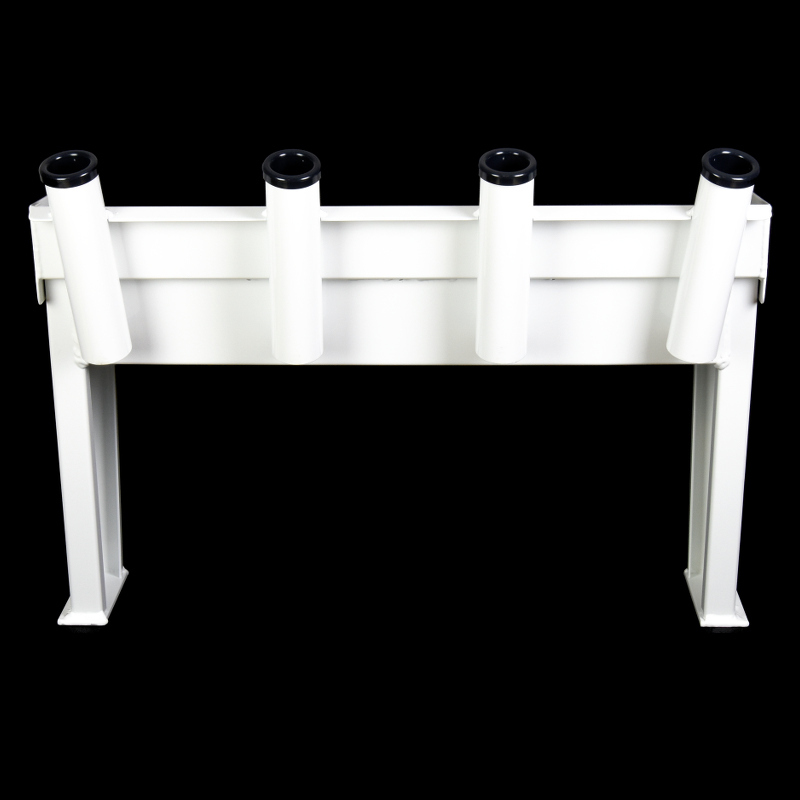 920 = 950mm outside to outside of the mounting feet. Special Features only found on Prowave ® Bait boards. 1. Prowave ® bait boards only use UV stabilised marine board for the cutting surface. No house hold indoor chopping boards used which go yellow and brittle in the sun over time. 2. The cutting surface has recessed pop rivets holding it down so it doesn’t bow or bend in the sun. Having the cutting surface fixed down also means it won’t fly off whilst driving. 3. All our folded legs come with a double return folds on the front and back of every leg which increase the strength and also looks nicer than a single fold. 4. On the bottom of each leg we weld a 50mm x 6mm thick alloy plate which is very strong and gives our bait boards super strength for mounting to the back deck of your boat. Some other brands only have a single fold and a 2.5mm thick plate for fixing to your boat which allows the bait board to wobble and flex. 5. 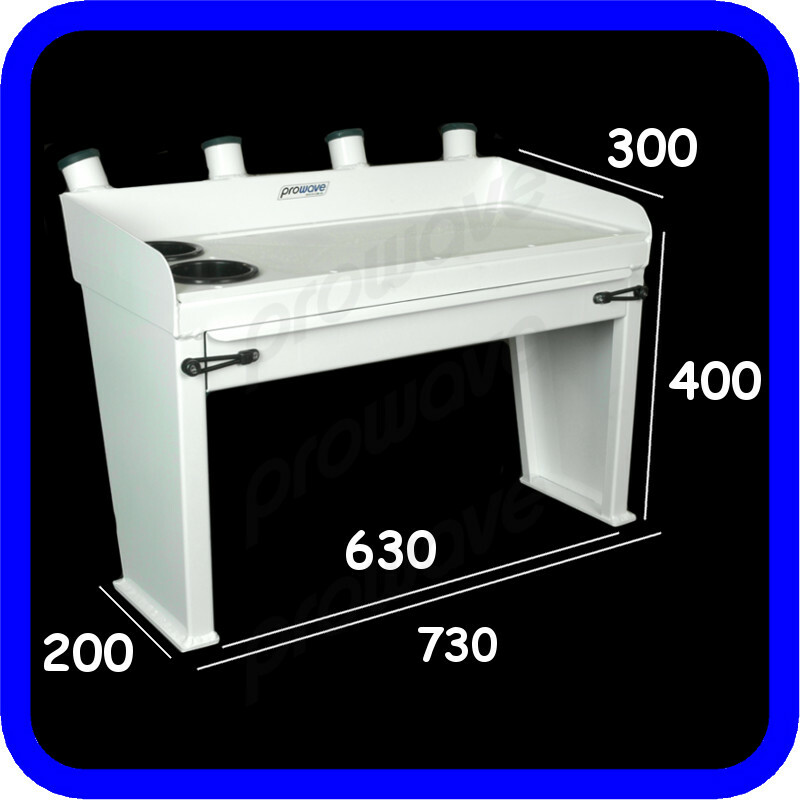 All Prowave ® Aluminium Bait Board with drawer come standard with 2 tags in the back of the drawer to stop the drawer falling out when you slide it open. 6. Our drawers also come with 2 bungee straps on the front of the draw to keep it secure and locked in place whilst not in use. 7. Looking at the back of our bait boards we fill them in with a panel that goes from one side to the other, which covers the back of the drawer making them look really nice compared to other cheaper brand out there. Great product – lived up to its good rep. Excellent communications, I rang before purchase to have more info and everything was answered . The delivery information was very good along with how it was packaged – no chance of damage unless it was a major impact , item recieved on time and even had a chat wit.h the delivery guy overall one very happy boatie! The husband is very impressed took only 1 week to get to us which is pretty good, was his birthday pressie so on e happy husband ?? Amazing service!! Ordered Friday, was delivered Monday. 10 minute job to fit it to the boat. Excellent quality workmanship and finish on the baitboard!! Very pleased, exactly as described. Arrived promptly. Husband loves his new prowave 700 wide aluminium painted bait board with drawer. 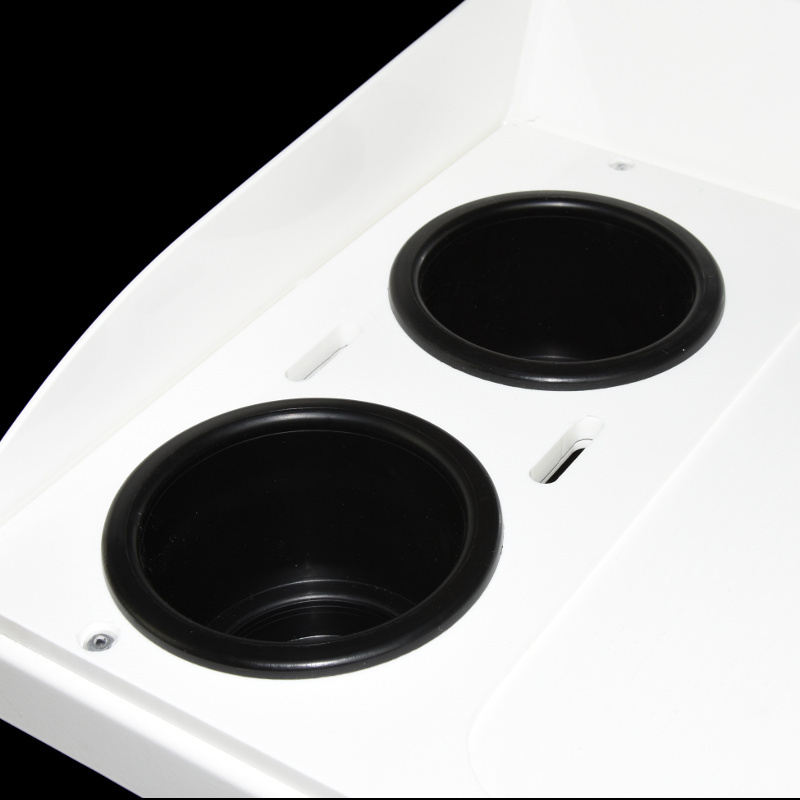 It fitted perfectly to the back of our Webster Twinfisher 4.3 & the colour match White was spot on with the boat. Great service & delivery in making this purchase. I am extremely happy with every aspect of my purchase of this bait board. The website had all the information I needed with excellent description and pics so I knew exactly what I was purchasing. Postage was quick with reasonable cost and when the product arrived it was wrapped well and arrived in perfect condition. The quality is next to none and when fitted to my Webster twinfisher it looks like it’s a factory option. I would highly recommend these products which are top quality at a great price. Great service ordered late for Chrissy the board came within 3 days, everything I expected and more Son-in-law over the moon just what he wanted! I would recommend this company to other folks wishing to purchase a quality item. Excellent bait board.Had height reduced by 100mm. No trouble for the guys at Prowave. Communication was excellent and prompt delivery. Great bait board, fitted it to a stacer 4.9 nomad looks like a factory option very well made had the guys fit a custom shelf as well and no issue for them, exactly what I was after, well packed and good delivery highly recommend. Very happy with the bait board. Very strong and extremely well made, perfect welding. Unit was also very well packed and travelled interstate without a mark. Impressed with the quick delivery too. Well done Prowave! Great product. Well made. Exactly what I was after. Very good company to deal with.